The Carnegie Corporation of New York and John D. and Catherine T. MacArthur Foundation, via a joint project called Reinventing Civil Defense, will be funding an expansion on Center-Surround in 2019. 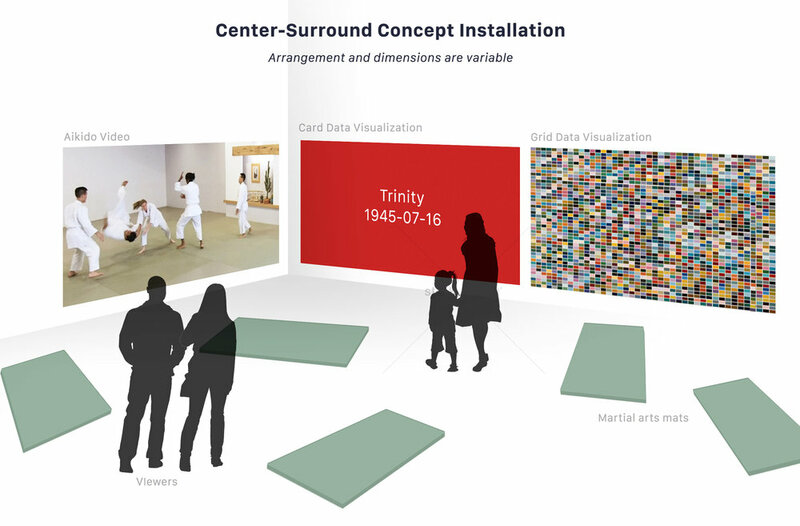 This grant, administered by the Stevens Institute of Technology, will enable additional exhibition dates at the in New York vicinity and beyond. Note that ticketed performances start nightly at 8pm. 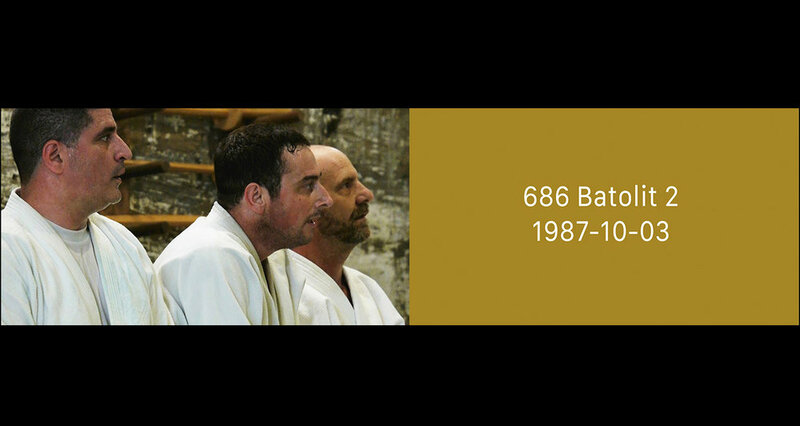 Center-Surround is a two-channel video juxtaposing video of a multiple-person martial arts practice with an animation of the name and date of every nuclear weapons explosion to date. Looping every two hours, Center-Surround uses the intimacy of hand-to-hand combat to reframe the impersonal violence of weapons of mass destruction. The first video shows of a group of aikido practitioners continuously sparring and throwing each other onto mats (aikido as a modern martial art grew out of post-WWII Japan). They are practicing randori, a stylized free-style exercise in which multiple opponents attack in waves. In aikido, the defender avoids brute force and instead respond with movement, creativity and empathy for their opponent. Nonetheless, aikido randori is quite vigorous; as each opponent is thrown onto the mat their body makes the distinctive ‘slap’ sound of a breakfall. On the opposing wall, a second video shows a succession of colored cards. Each card marks the name and date a nuclear explosion, starting from the 1945 Trinity Tests, Hiroshima and Nagasaki bombings and each of the 2056 nuclear weapons tests to present. The two videos are synchronized such that each card appears precisely at the time of a breakfall in the video. The ‘slap’ sounds propagate through the gallery like a soft thunderclap, while the colored cards infuse the gallery with light. Center-Surround loops every four hours, which is how long it takes the performers to represent each detonation as a breakfall. Expansive in scope and minimal in style, Center-Surround is an empathy-building meditation on the apocalyptic sublime. The juxtaposed videos physically embody a level of violence which is usually experienced in the abstract: world-shattering apocalypse. Using martial artists to metaphorically re-enact the nuclear arms race within a stylized framework, Center-Surround invites viewers to feel, in a small way, each of these terrifying weapons, not as abstractions or cinematic fictions, but as complex interactions between very real human beings. As exhibited at Fridman Gallery, 2019. Very special thanks to Wood Huntley for his generous support.